In Utah, the 24th of July is a state holiday, Pioneer Day. 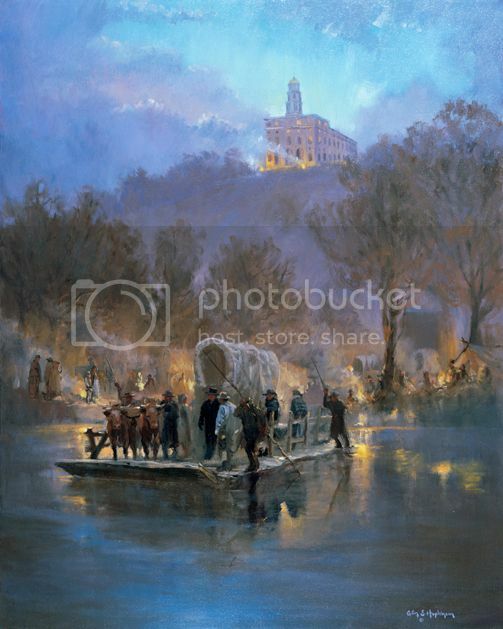 It celebrates the day the Mormon Pioneers entered the Salt Lake Valley and began this great state. We Mormons have a turbulent early history. To escape religious intolerance, our ancestors traveled from New York, to Ohio, to Illinois, and finally Utah and the West. In Nauvoo, Illinois they had built a beautiful temple to our God before persecution finally pushed them out. Knowing the building would no longer be used after they left, they wrote in gold letters on the wall: "The Lord has seen our sacrifice. Come after us" as if speaking to us, the future generations, from the dust. My own personal ancestors made this trek, from Nauvoo to Salt Lake, suffering hunger, thirst, and fatigue, and losing many loved ones. Agnes Haley Love Flake ended up the San Bernadino Valley of California, after suffering the loss of her husband and several children. She was weak and frail from sickness, impoverished and living in an earthen shack with a dirt floor. When the wind would blow, dust would come in through the crude door and cover the meager furnishings. She sat in her chair most of the time, too frail to move. Her brother discovered her whereabouts when he was in California pursuing gold. They had grown up together in a life of privilege: plantation living in Mississippi. When he witnessed her poor health and desolate conditions, he begged her to come home with him. All he asked in return was that she denounce this Mormon religion that, as he saw it, had caused her so much pain. "You don't think you are asking much, do you?" Agnes responded. "No, very little," her brother replied. Somewhat taken aback, her brother retracted. He told her to send a letter if she ever changed her mind. That letter, she promised, he would never get. She never saw nor heard from her family again. She died in poverty, surrounded by nothing but her children. Her oldest son William was forever marked by her sacrifice, and he too devoted his life to service as a result, and instilled it in his children and in all the generations since. "Come after us," Agnes says to me. I remember you, I say to her, I am always remembering you. We tell these stories not to promote your faith, to help you do hard things. We tell these stories because this is who you are. This is your spiritual heritage. This is what God looks like inside of you. It is the past, the present, and the future. For how can I forget, I say, when you are written on my heart? "Come after us," they are saying. What a wonderful, inspiring story! Thanks for sharing!